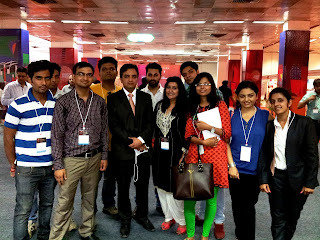 INLEAD facilitated an Industry visit for Event Management & Public Relations April 2013 batch students to the India International Leather Fair, scheduled from 4th of July to 6th of July 2013.The exhibition took place at Pragati Maidan, New Delhi focusing on Leather Products, machineries and other allied industries related to leather production. It was an in-depth learning about organizing an exhibition. The students had an opportunity to witness diverse types of production platforms; new technology based lighting, audio & sound systems. It also facilitated their learning and understanding of the fabrication aspect in an exhibition. The students were told about how an exhibition is conceptualized and sold in a particular domain. They gained insight into setting up of the whole exhibition which involved Octonorm stalls, the size of different stalls, the lights used, etc. It was a good platform where the students got an overview of visual merchandising, kiosks, display through hoardings and sponsorship activities for an event. Students had an opportunity to clearly observe the exhibition starting from the registration counters to the exit check systems. Overall, it was an over-whelming experience. The combination of a corporate event & an exhibition, equipped the students with knowledge of the 3D environment, stand designs, exhibition displays based on ‘design and build’, creativity, innovation, fabrication, carpeting, hanger designing, branding, lights, signage, floor plan designing, exhibition badges etc. 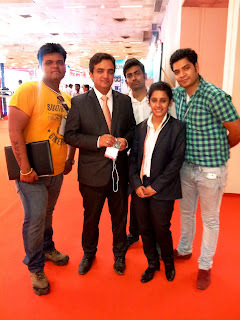 According to Mr. Parshant Garg (Event Management & Public Relations, July 12): It helped in understanding the various aspects of fabrication and execution of exhibitions. Sona Sharma (Event Management, Jan 13): We learned about ITPO and the concept of Exhibition commercially.